Project Triple8: Chapter Three "The Plan - Phase 2"
As I mentioned the next part of the plan was to get some serious “shuteye” and I last left you with an image of me sleeping on the floor at Moonriver Lodge (MRL). Looks, as we all know though, can be and often are deceptive. 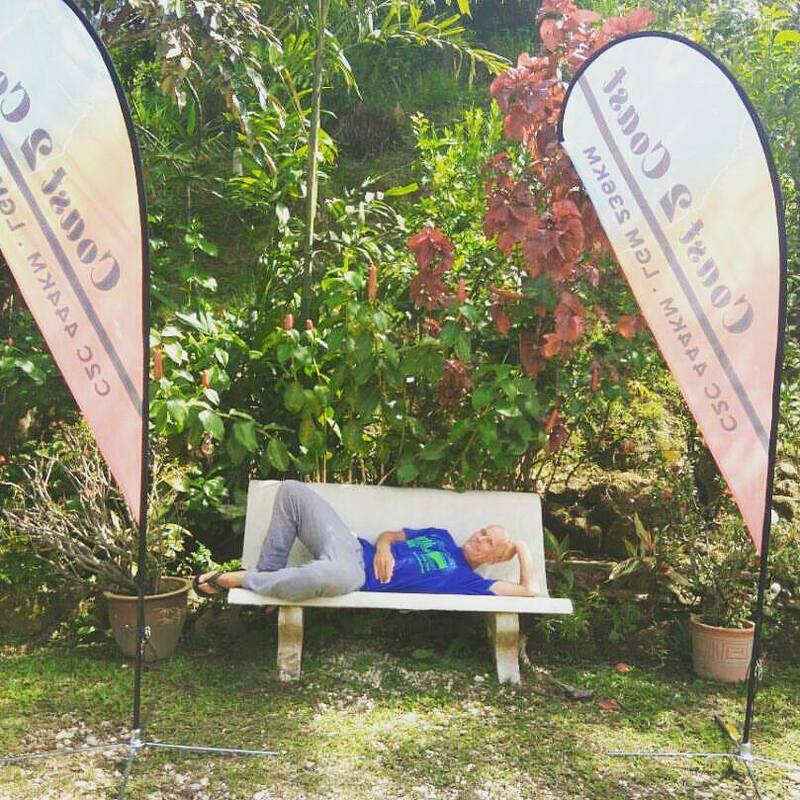 Here’s actually what happened after arriving at MRL, our 7 Star Checkpoint 3. After spending an inordinate amount of time having one of the best and most deserved hot showers of my life. I was really ready for a good rest and we are not talking feet up chill out rest here. We needed some serious shuteye! Unfortunately, with the euphoria of getting so much done to plan I struggled to turn the machine off and slip into sleep mode. Additionally, as I wanted to switch off, the other guests (I naively hadn’t been expecting any), particularly their children, were switching on!! Sadly, this combination meant that I was like a dog pacing around struggling to find the right place to settle for a snooze. Despite several hours of tossing and turning in both the allotted rooms for racers and their support crew and a variety of other locations around the Lodge, including the concrete floor that I was snapped on and was attracted to because of its coolness and quiet location. I finally gave up trying to sleep and opted for a impromptu massage that I was offered by the medical team. This was a most unexpected and surprisingly welcome discovery. 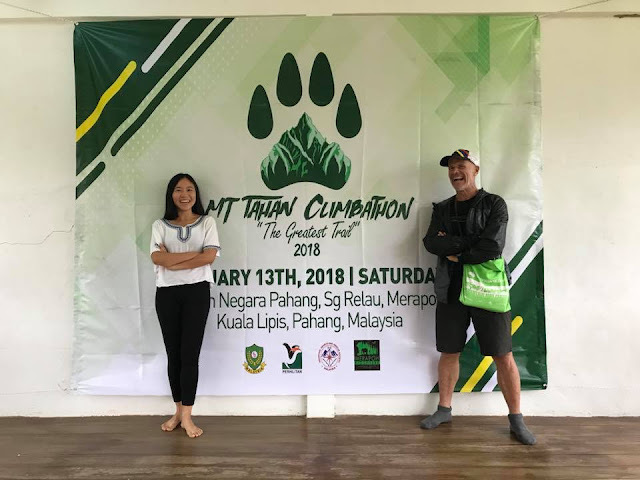 As Amirul, the medical team’s Physio, and his colleague gave a really great sports massage and their attentions started to breathe new life into my legs. By late morning a handful of other runners started arriving, the first of these was Chun How, closely followed by Rose, Allan and latterly Seow Kong. Whilst sitting outside on a bench one of Chun How’s support team came up and casually enquired when I was thinking of leaving. Not thinking, I gladly shared Jim’s and my plan to kick off around 4pm that afternoon to miss most of the sun, with the goal of making CP5 for breakfast the next morning. 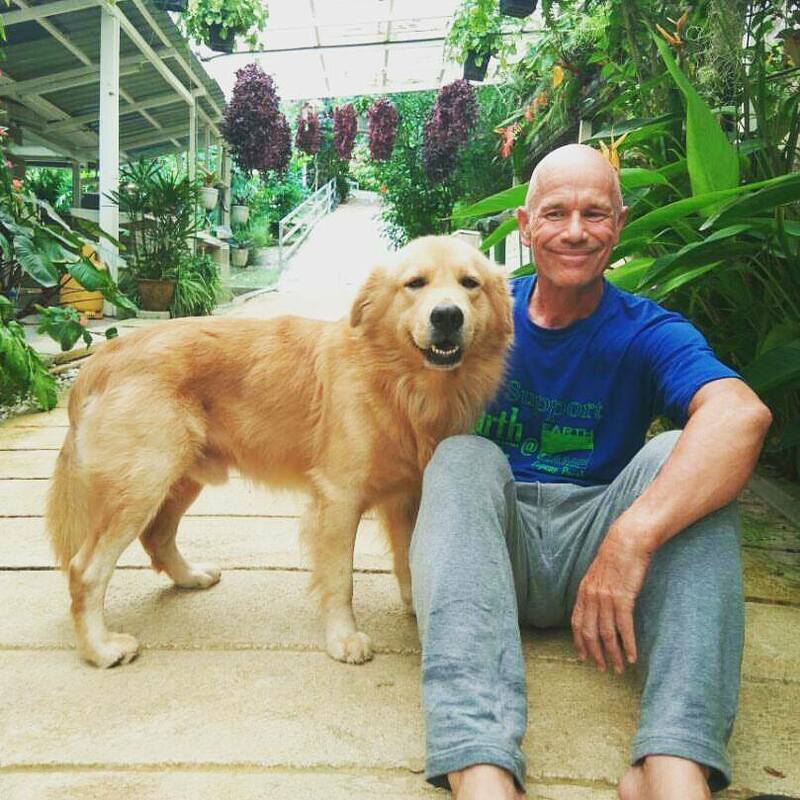 They asked if I’d be willing for Chun How to join Jim and I which I certainly had no objection to, given that it was his plan to join me for the cycle back, there was a good logic to us “Buddying” up so to speak. I then wandered off in search of more fuel as despite having only just eaten breakfast it now seemed like brunch/lunchtime where I tucked into a super feast of scrambled eggs, baked beans, and toast that Elsa had prepared as per my nutrition plan which was washed down with some white rice, delicious dhal and lashings of excellent mint tea courtesy of the gracious generosity of MRL and their wonderfully welcoming Nepalese kitchen staff. Sated with this super meal I finally discovered the ability to sleep and managed to get my head down for what was possibly 2 hours. I’m not sure what woke me eventually but it definitely wasn’t an alarm as I’d forgotten to set one. This could have been a serious mistake but thankfully either something internally or externally had done that job for me. This was most fortuitous though as the first person I saw was Rudhra and he informed me that Chun How, Allan & Rose had left about 30 minutes ago at around 2pm. This I confess took me by surprise as I’d seriously been expecting Chun How to tag along with us at 4pm. Rightly or wrongly, I interpreted this as a cheeky bit of gamesmanship and stuck my head into Jim’s room where he was reading and said “get yourself ready Mate, there’s been a change of plan and we’re leaving now”. Within 10 minutes we were heading out of MRL simultaneously with Seow Kong. At our first Aid Station, it became obvious to me that any attempt of gamesmanship and duplicity by Chun How and his team in an effort to steal a head start on us was rather unfair of me. The reason for this was that Elsa and Rudhra estimated that they were only a few kilometres ahead of us and were walking casually 3 abreast which did not seem like a serious plan to make our lives difficult. As such we slowed our pace from mid 6 minute per kilometre pace to mid seven minute pace. In spite of this a few kilometres down the road we caught and passed the three of them who sportingly stepped to one side and gave us a very rousing burst of applause as we jogged passed them. Other than at CP5 this would turn out to be the last time we’d see any of the other runners on the road until the finish line. As whilst we didn’t kill ourselves, Jim and I made sure that we made steady and sustained progress at or around the mid 7 minute pace that we were both comfortable at whilst still conserving ourselves by choosing to power walk the hills of which there were plenty. 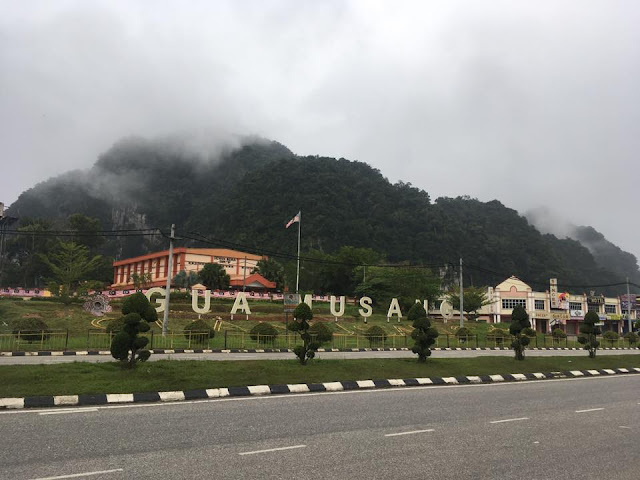 In fact, talking of hills, whilst the profile showed that Sectors 4 & 5 were downhill into Gua Musang there was still a lot of sustained climbing to do and by the time we’d reached Gua Musang we’d have done a further 1,360 metres of elevation to add to the 2,152 metres we’d covered the previous day. We arrived at CP4 at Kampung Blau, 48 kilometres away from MRL, at 21:46 with a cumulative time on our race clock of 38:16:05. This meant we’d done the stage in around 7 hours and kept us close to 10 hours ahead of the cut off time for this stage of the race. 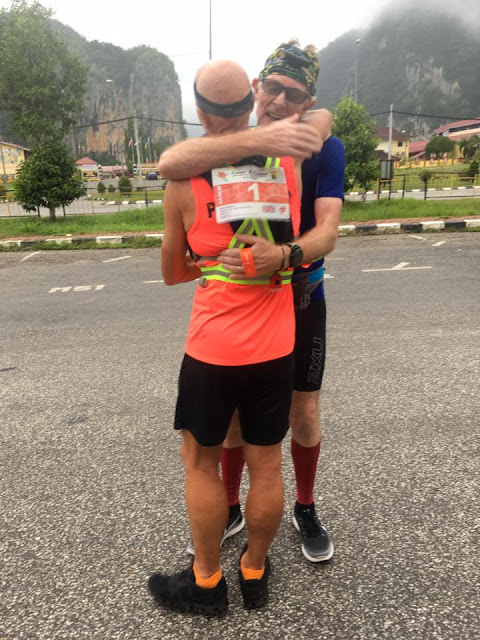 After Elsa and Rudhra had dealt with the check in formalities for the Checkpoint we continued on for a couple of kilometres to an abandoned roadside cafe that Elsa had identified a few weeks ago whilst I was doing a familiarisation run as we travelled to the TMMT event in Merapoh. By the time Jim and I reached here not only was supper served but the temporary camp was set up and we quickly got our heads down for what I intended was going to be a serious power nap. Thankfully, Elsa had rigged up our one man tent for me and I slipped into here and almost immediately went out like the proverbial light bulb. I slept for a good couple of hours but I was woken suddenly by the sound of dogs barking incessantly and when it was evident to me that they were not going to stop anytime soon and I started having visions of the reason for this being that the rest of the field were now in full flow and all running past our camp as we slept comfortably like the Hare in the famous fable. With this thought in my head I eventually shouted out if anyone else was awake and immediately heard back a chorus of confirmations that everyone was. It turns out that the dogs had been barking for ages and poor Jim & Rudhra, in particular, had not got a wink of sleep. Rudhra, who was doing a great job of keeping an eye on what was happening behind us whenever he could get a connection to the Live Tracking website, dispelled my paranoia that anyone had run past our position and set the dogs off. 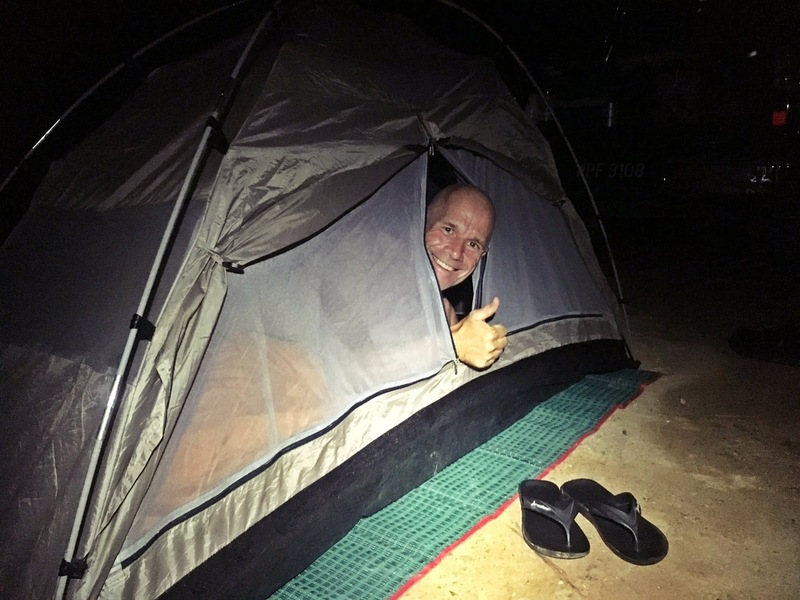 Despite his reassurances though and the fact that it was circa 2:30am 1 hour ahead of when we had planned to be on our way again, within 5 minutes Jim and I were heading down the road again while Elsa and Rudhra were packing up our temporary camp. 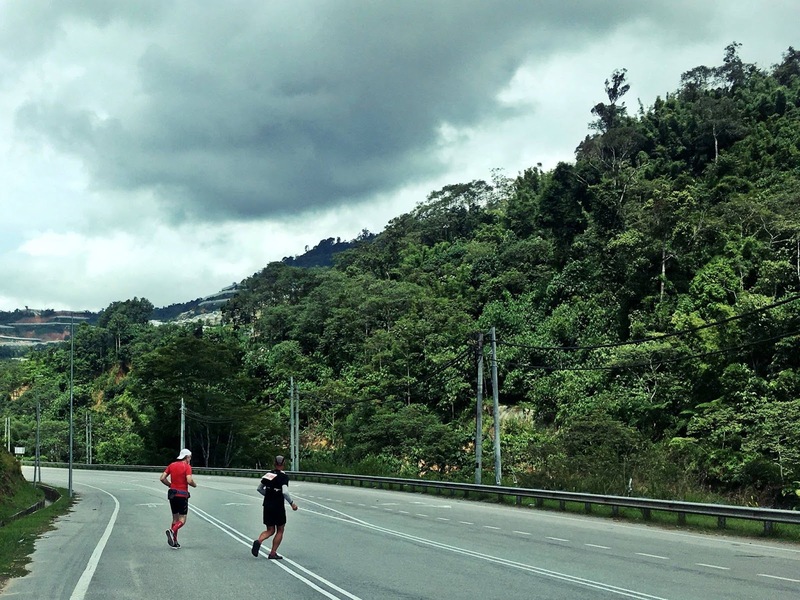 The road into Gua Musang continued to undulate and we continued our previous strategy on pacing in terms of walking the climbs and sustaining a comfortable mid 7 minute per kilometre pace. We also continued chatting to each other, as I knew we would, and Jim proved to be not only great company but a great companion too. As a consequence, with dawn breaking in a rather sadly unspectacular fashion we found ourselves heading along the narrowing road that wound through a lot of palm plantation into the outskirts of Gua Musang. With 8 kilometres to go there was one final hill which meant that we slipped to almost a 12 minute kilometre pace. However, other than this minor blip we quickly were back on the mid 7 minute pace and averaged 8:09 minute pace for the entire 88 kilometres bringing us into what I was referring to as the half way stage in a running time of 11:56:51 for Sectors 4 & 5 and a cumulative race time of 48:39:26 e.g. just 2 days of the 5 days allotted us. 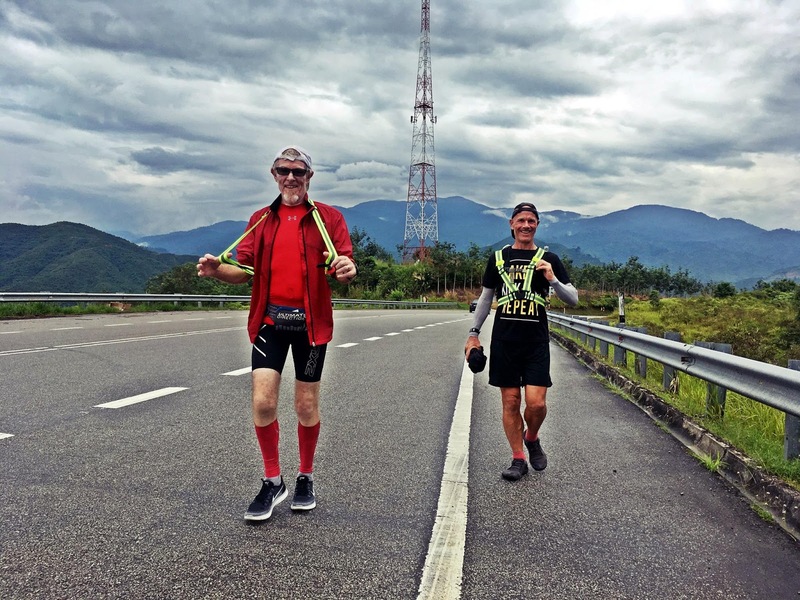 As well as being an absolutely brilliant bloke and amazing companion, Jim aka Running on Old Legs is at 69 also a running phenomena in my humble opinion. 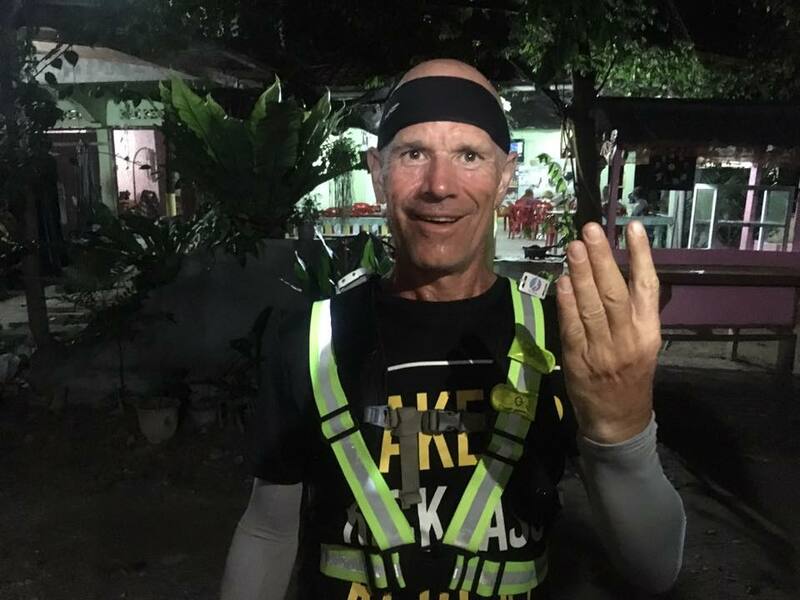 This was his longest ever run though which he described as great prep for a 100km run that he was attempting do in a 12 hour event that he was running in a couple of weeks time. And, whilst the veterans category starts with men that will be almost 30 years his junior, I know that he’ll excel in this and, if I were a betting man, would have a large wager on him being on the podium. In addition as well as an exemplary member of Team Live More Jim stands alongside a handful of other amazing men that I regard as my Mentors and Luminaries in terms of the inspiration they give me for how I choose to live these days. 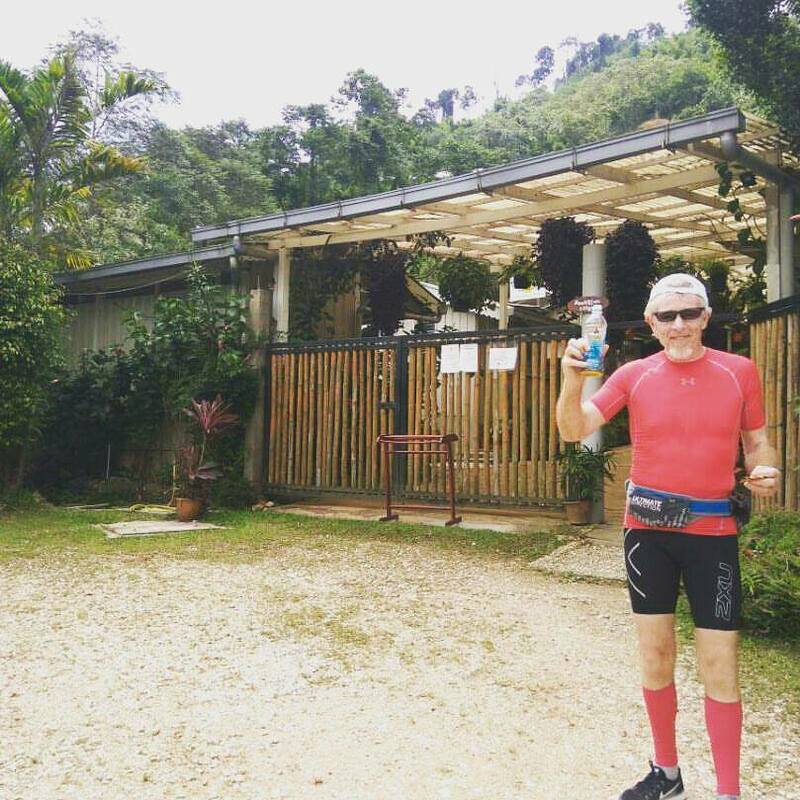 These men include Woody Woodville, my Step Father (who’s 90 and still playing tennis and bowls), Mr Sze Mun Yee (who’s in his 80’s and still doing IM distance Triathlons - you can read more about him in his book here https://www.amazon.com/Bumble-Bee-Me-Living-Ironman/dp/9671443508) and Sam Pritchard (who’s 67 and still stronger and faster at Swimming, Biking and Running than most men I know that are half his age). 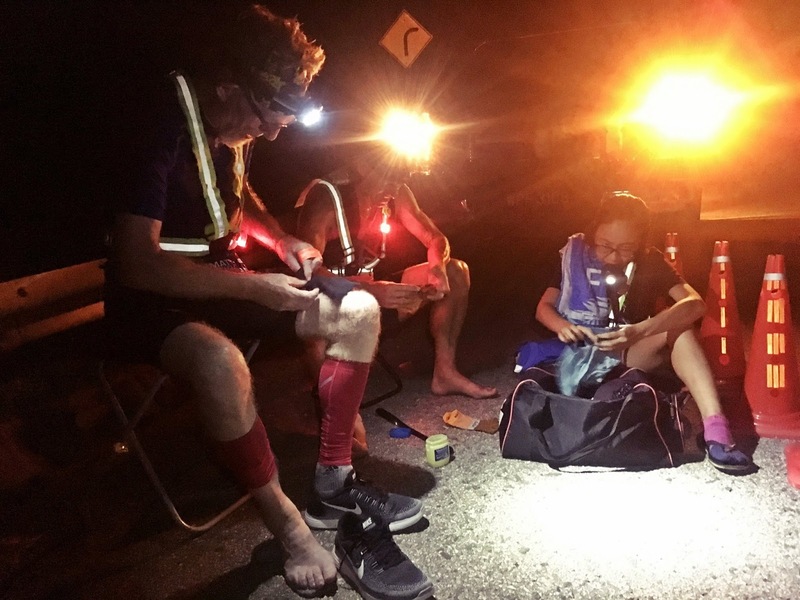 We were not quick but we were consistent and if there is ever a way to run “ultra” distances making “Relentless Forward Progress”, as Byron Powell explains in his book by the same name, and as we did that night, is the secret to running Ultramarathons. Although, I strongly believe that a critical prerequisite of being able to do this, is feeding yourself enough fuel too. 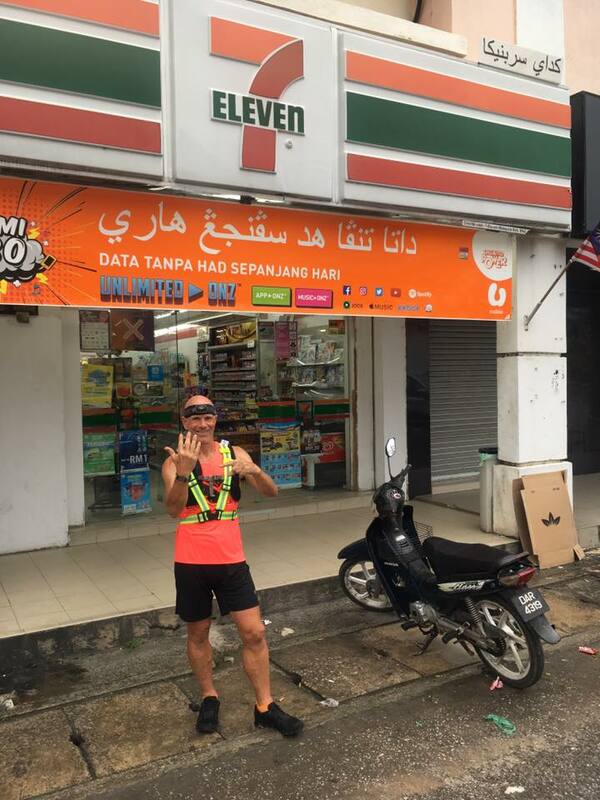 So, shortly after 8:09am when CP4 was just closing almost 50 kilometres behind us, we arrived at the Seven Eleven that was CP5 in Gua Musang as per our plan and, after the usual CP race admin had been done by Elsa and Rudhra, we all headed for the Mother of All breakfasts at the penultimate part of of our plan which was a superb little Coffee Shop set beside a wonderfully ancient Chinese Temple and old Gold Mine in Kampung Pulai. As we were driving there the heavens opened and we collectively breathed a sigh of relief just as we had yesterday morning that we were still on point in terms of our plan and that compared to the poor other runners that were still out there, this plan seemed aligned with the stars and the weather system. As it meant that we were going to stay dry, warm and well fed by comparison the rest of the field that, according to Rudhra, were now spread 20-40 kilometres behind us.